What one thing would improve my life as a type 1 diabetic? I was interviewed by the JDRF magazine yesterday. They asked me about my running, fund raising, diagnosis etc. If they publish an article I will post a copy on here. 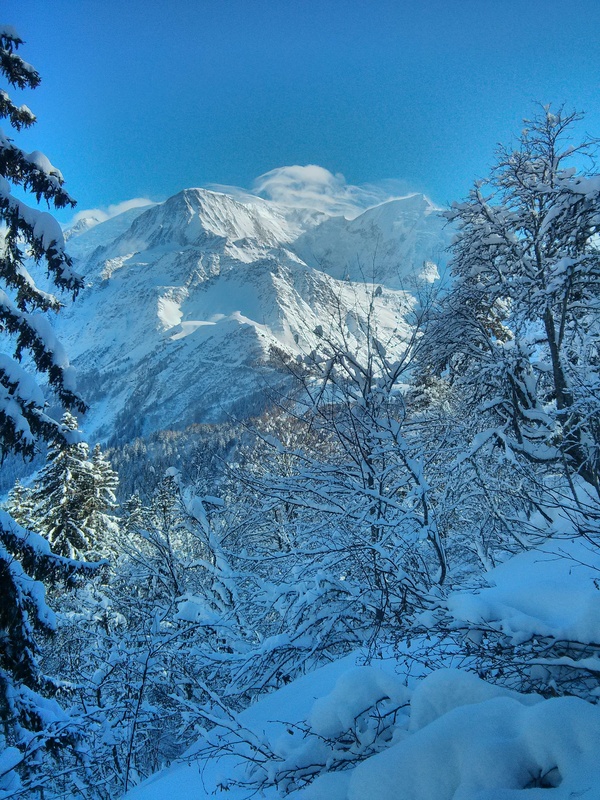 Gratuitous shot of Mont Blanc. What an amazing view to have whilst marching 850m up a hill. I’ve just come out of a two week long cold. Despite evidence to the contrary (I got diabetes six months ago), I think of myself as someone who never gets ill. So getting a cold and feeling low on energy and not wanting to run was a real blow. Not least because my fund raising page reminds me that I only have 54 days left to the Marathon. Given that I want to run it in a very challenging time, two weeks of almost no quality training is a real blow. I’m still waiting for comments on whether I should run the marathon in a Onesie by the way. So far two people have commented, and that’s not quite enough to encourage me to do it! If you told me last October that I’d be having a second honeymoon within a year I wouldn’t have believed you. But here I am enjoying the “honeymoon period” in type 1 diabetes. The photo above is from my first honeymoon to Patagonia. I put it in the post cos it’s more interesting to look at than all the charts! When I first got diabetes, I thought I’d be able to do loads of clever things with my data to get good at managing it. I’ve been collecting data enthusiastically, but making sense of the mountain of data I’ve produced is difficult. Plus I spent two weeks not recording anything at the start of November because I was sulking. Sulking because my smartphone app which I use to record all my data was bought by another company and they seriously dis-improved the user experience as a result. I was shocked at the emotions I experienced when something I use and depend upon every day was changed: I was more angry and upset about that than I was about being diagnosed with diabetes in the first place! So were many other users if the number of horrendous reviews on Google Play were anything to go by. Luckily they fixed the problems, but that explains the gap in my data below. Data Diabetes Management What is type 1? I’ve mentioned JDRF a few times before in my blog. JDRF are a global charity that aim to find a cure for type 1 diabetes, and to support people living with the condition. When I was diagnosed, I almost immediately applied to JDRF to run the marathon for them. (I’ll be asking the readers of this blog for sponsorship at some stage!) I wasn’t sure whether they’d have room for me, so sent them a link to my blog. They liked it, and asked me to write a short piece for their website, which has a “your stories” section about people living with diabetes. Click here if you’d like to read my story. From a selfish point of view, I am actually more thankful for the support I’ve received from the JDRF than about their funding for research. Although both these things have already made a difference to me. When I was first diagnosed, Dr Powrie gave me a pack from JDRF which contained loads of information – particularly a book written by JDRF which contained all the information I needed to understand the condition. It was a great support and the JDRF, Diabetes UK and Runsweet (written for athletes with type 1) websites are an invaluable source of information for me. Other people with diabetes, parents of diabetic children, tax payers who fund our treatment, and of course myself, would all love for there to be a cure. And JDRF sponsors many strands of research (their tag-line is “treat, prevent, cure”), from better treatment of diabetes to artificial pancreas implants. I’m currently participating in a phase one trial funded by JDRF which may help stop the destruction of beta cells. (If I’m very lucky my immune system will slow down its attack as a result of the trial, and in any case I see a research nurse and doctor every fortnight which helps my understanding and management of type 1 enormously.) This would be amazing for diabetics. If someone could wave a wand and stop my immune system from destroying my insulin producing beta cells, I would be incredibly happy. I would still have to manage my diabetes with insulin, but I’m finding that living in the “honey moon phase”, where my body still produces some insulin, really isn’t that bad. 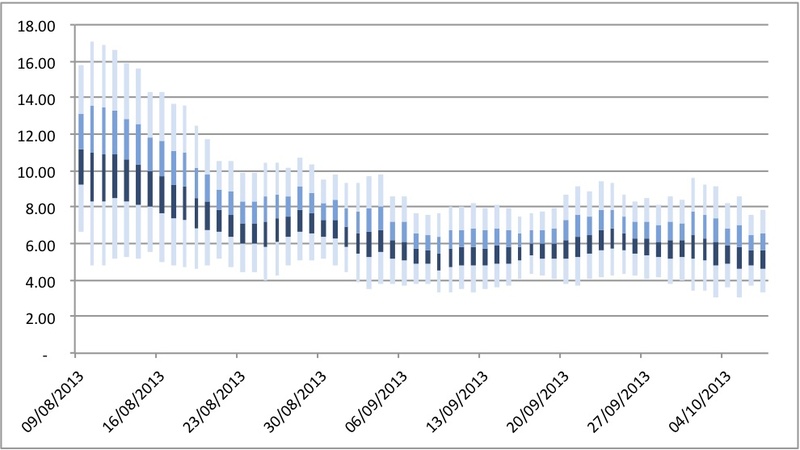 To prove this, here’s another fan chart of my blood glucose. A normal person will have blood sugar of between 4 and 7. The chart below shows that almost 95% of my blood sugar readings (at meal times, waking up, and bed time) are between 4 and 8. That is pretty good, and I hope (but don’t know) that my doctors will give me a pat on the back and tell me I don’t need to worry unduly about complications. 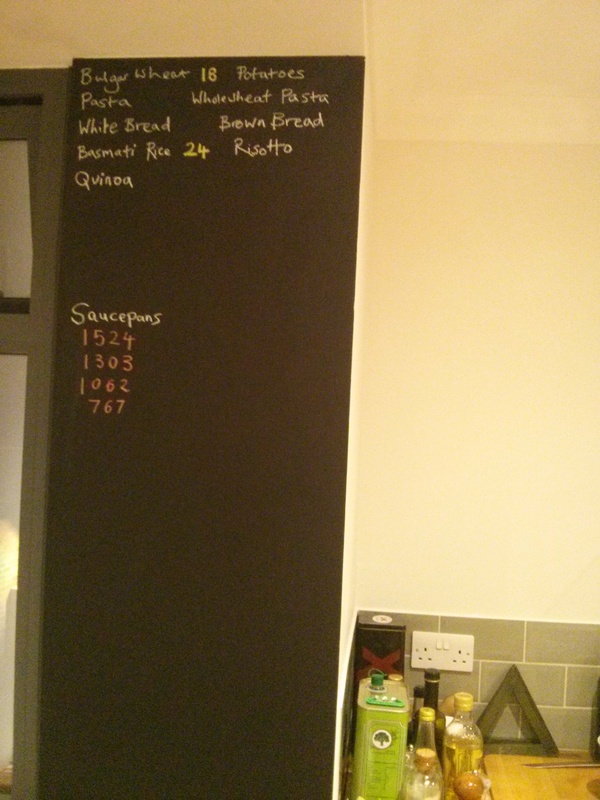 The new feature at home: I turned a bit of the kitchen into a blackboard, and am now adding carb contents per hundred grams of commonly cooked stuff. I also have weights of our pans so that I can subtract that off whatever I need to weight inside the pan. Never ending maths! I have returned from holiday. Relaxing in Croatia was luckily just the thing I needed and gave me some space to come to terms with my new condition. We were lucky enough to have a cook, and she must have thought I was a real English eccentric: insisting on having my digital kitchen scales at every meal to calculate how many carbs I was eating. My family started off by waiting politely for me to test my blood, furrow my brow, calculate carb content and then administer medication before eating, but they quickly tired of that when they realised how much time I had to spend on all the faff! Having returned home, I received the good news that I am eligible for the monopepT1De study. The name is a clever play on words: “T1D” is short for “Type One Diabetes” and the study is about using mono peptides to stop the body’s immune system from destroying the insulin producing beta cells in the pancreas. There is some information on the trial here. If you’re feeling really clever, you can read more here. During the 1980s, it was found that by using auto-immune suppression, the destruction of beta cells could be slowed. However given that insulin therapy is relatively straight forward, the side effects of non-specific auto-immune suppression are considered undesirable. A treatment whereby the auto-immune response is changed in a more targeted way has been pioneered for certain clinical allergies. Dr Liu (who I will be seeing) and colleagues have developed a version to treat patients with type-one diabetes. The trial will involve me going to the hospital every fortnight to receive an injection of the peptide “vaccination”. Patients are all recently diagnosed type one diabetics, and are split into three groups. One group will receive the peptide injection every fortnight, one group will receive a placebo, and the last group will receive alternating injections of peptide and placebo. The trial is “double blind”, meaning that neither the patient nor the doctor administering the treatment know which group the patient is in. The primary outcome of the trial is to prove that the treatment is safe. The secondary objectives are, I quote, “to assess stimulated C-peptide production, HbA1c, mean glucose excursions, quality of life scores, and islet cell auto antibody biomarkers of beta cell specific immune responses.” I have no idea what that all means! But if it works, it should allow the patient to be less dependent on insulin injections than they may otherwise be. I’m keen to do the trial for two reasons. Firstly, it is all for the good of science and developing effective treatment! Secondly, there is a small chance that I will receive the treatment rather than the placebo, and a chance that it may work. I’m not too optimistic though, because apart from anything else, I have already experienced “clinical onset” type one diabetes, which means that I have lost enough beta cells to be insulin dependent. This treatment will not replace cells already lost, and they do not grow back themselves. Also, in my position, I’m just keen to get to grips with managing the condition. I don’t want to start dreaming of a cure to diabetes as there isn’t one yet, and that will only be setting myself up to be disappointed. A month in, life isn’t too bad so I can live with the injections. I’m also getting very good at mental arithmetic! The study is funded by the JDRF (I am raising money for them by running the London Marathon) and the Diabetes Vaccine Development Centre.